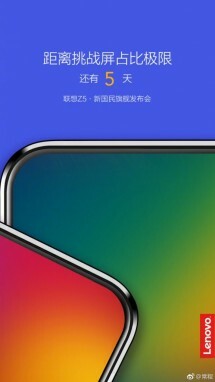 Lenovo Z5 is arriving on June 5, as confirmed on Monday. And a week later, on June 12, the phone is will already be available for purchase, according to a listing by the Chinese online retailer JD.com. The flash sale will begin at 10 AM, and chances are stock won't last more than a few minutes. Already more than 10,000 people registered their interest and the phone is not even officially announced yet. Meanwhile, Chang Cheng, Lenovo's VP, shared some more teasers of the bezel-less phone on his Weibo profile. 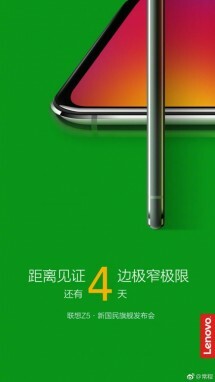 The metal rim of the phone is lined up similar to the digits 5 and 4, counting down the days until the official launch of the Lenovo Z5. Each day new teasers reveals bits and pieces about the phone. The rumor mill is suspiciously silent on the upcoming Lenovo flagship. All we know so far is that it will have a massive battery with the possibility to go 45 days on stand-by in one charge cycle. It will also arrive with a gradient paint on its back and the ZUK user interface, more commonly known as ZUI. You are not the person I replied too. Most likely just a place holder. Otherwise it would be the most expensive mass produced phone. Even the Iphone X is "only" $1000. Gearbest had it around $650.